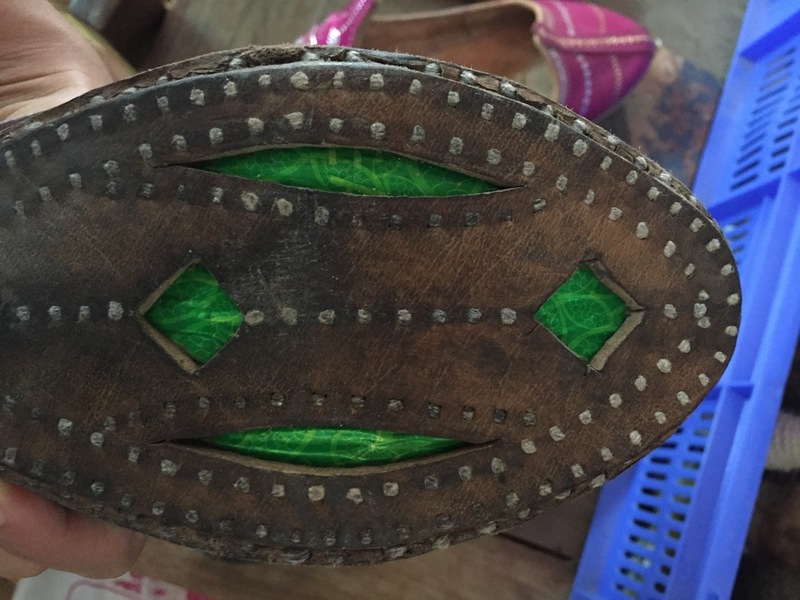 I’m sitting next to Ranabhai, a leather artisan who has been making traditional Kachchhi shoes for many decades in the village of Hodka, Gujarat. Ranabhai uses the same rohi (flat stone work surface) as his great-great-grandfather. Yet he’s lived through quite a few changes to his craft. Artisans used to harvest and cure their own leather, now they buy it from factories in Ahmedabad. The intricate stitching of jari work used to be done with real silver, now they use metallic colored plastic thread. Patterns that used to be painstakingly cut by hand are now created using metal punches. My team at Khamir is working on an exhibit that will open in December on the communities and practices of leather artisans in the region. We’re researching for the exhibit, but also trying to document every aspect of the craft with digital cameras and notebooks. The only artisan I spoke to who was interested in creating his own archive of leather products purely for posterity was the accomplished Basarbhai, who has traveled as far as Japan and Germany for exhibitions. “I have told others that we should carefully store old designs because twenty years from now, someone will find them useful.” He’s wary of outsiders documenting and archiving though, as tourists in the past have misused footage or photos of their community (particularly their women) in ways his Marwada kin find inappropriate. I can understand the concern. This is a country that was colonized for centuries by British imperialists with an insatiable need to collect, categorize, and archive. At best, this documentation did nothing to benefit local populations. Objects and images were plucked from their context and presented to an outside public. 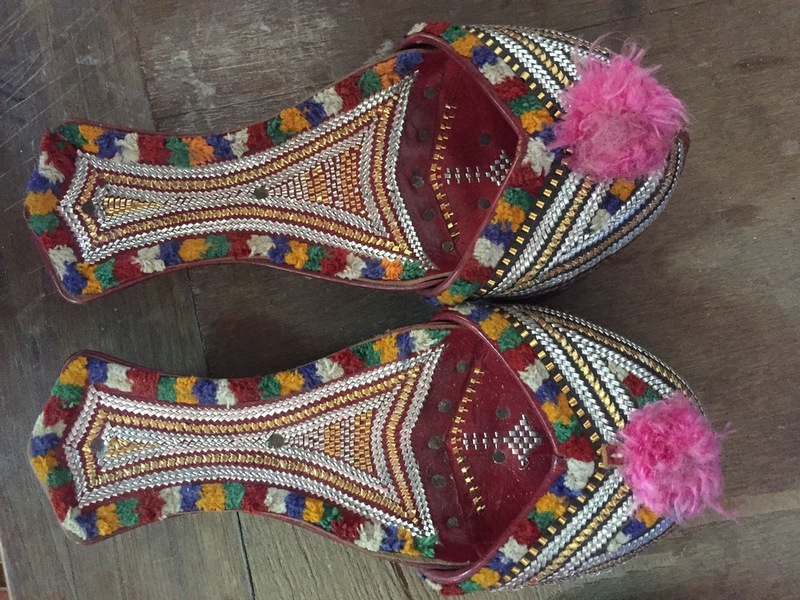 In as rural a region as Kachchh, even a local organization like Khamir can feel like an outsider to communities of leather artisans, so our impulse to meticulously record each aspect of the craft sometimes feels uncomfortable. How can we both ensure that the knowledge of this intricate craft isn’t lost forever, without exploiting the artisans? How can the archive we create actually benefit the artisans in their work? After all, if artisans don’t have a way to support their families, their craft will die out whether we document it or not. This work should support the artisans as well as highlighting the art. While our team was interviewing Trilokbhai, in the village of Pragpar, he showed us a small album. In it were pages of photos he kept of his designs to show buyers pattern options. It was a useful tool for him to show off the range of his abilities, a portfolio of sorts. I was fascinated - it was the first time I’d seen an artisan document his own work, and he had done so for the very practical purpose of making sales. A tailor I encountered in Bhuj keeps a similar magazines of blouse designs to show clients to help them choose the patterns they’d like to purchase. This seems like a possible solution to the archiving and documentation dilemma. Where a museum of archaeology of anthropology often facilitates outsiders coming in to a community, photographing and collecting, and display objects for other outsiders, these catalogues of work allow artisans to document their art for their own benefit. They control the narrative of how their own work is presented, with tools already at their disposal. Most of the artisans already have absorbed mobile phones into their lives, and particularly the younger generations all have smartphones with cameras, and at least enough data to support WhatsApp. Perhaps, I’ve been thinking, I could develop a simple mobile system (using a combination of tools that already exist, like Wordpress, Youtube, Tumblr, Squarespace) to facilitate artisans' documentation of their craft. It could be used for their own records, to share their work with other artisans, or to connect with buyers. It could include anything from an annotated, digital version of farma (traceable patterns to show shape and proportion), finished products, closeups of surface decoration. But these are early ideas. In order for this to work, I’ll have to integrate artisans into each stage of the process, from ideation to execution. Stay tuned!